Why are ya strangling yourself, Shashi? Eh? Why are ya strangling yourself? Well, gosh. We liked Sharmeelee, and now they've gone and made a male version of it. We take back everything we said, Beth, about Shashi being only an OK actor. But what does it say about the PPCC that after Junoon, In Custody, and Vijeta - all more typically cited sources of good acting on the part of our big hero, Shashi Kapoor - it should instead be the fluffy Haseena Maan Jayegi where we go, "Wow! He's amazing!" And - irony of ironies - Beth doesn't even like this movie! Haseena Maan Jayegi is basically the All Shashi All The Time Show. It's a 1960s romp through mindless mod fun - both in Carefree and Emo varieties - and it stars Shashi Kapoor in an excellent double role. First, he is rakish Rakesh (sorry), the college cad with a cat-calling obsession. Though Rakesh is a lot of fun (check out his first number where he teases Jab Jab Phool Khile's Pardesiyon Se Na Aankiyan! ), he is a total misogynist. Boo, Rakesh. Second, Shashi plays Kamal, the supreme scion of goodness. On paper, Kamal sounds like a bore - goody two-shoed, earnest, enjoys bringing dates to graveyards and delivering sermons - but he's actually quite endearing. Oh, you! Both Rakesh and Kamal fall for the same girl, one Archana (Babita). Archana is annoyed by Rakesh's skirt-chasing antics while charmed by Kamal's softspoken gentleness. Yet while Rakesh and Kamal have starkly drawn personalities - and here we must say, Shashi did a great job making them two different people - they are, after all, physically identical. More than once, Rakesh tries to use this resemblance to his advantage and, after Archana is duped, Kamal jokingly warns, "Watch out that you don't marry me and honeymoon with him." Did we just hear the bell of foreshadowing go clang? We're always so impressed by doubling in Hindi cinema. Well, this is 1960s pop Hindi cinema, so of course that's what's going to happen. Especially since the Sino-Indian conflict erupts and both boys, former military school students, volunteer to fight. When the two run into each other at the military camp, evil Rakesh decides now is his chance to bump off Kamal. There is a deliriously weird fight scene, as both Shashis are in identical uniforms, and director Prakash Mehra makes sure we have no idea which one just got punched. When it looks like one of the two has been bumped off, we follow the surviving Shashi back home. 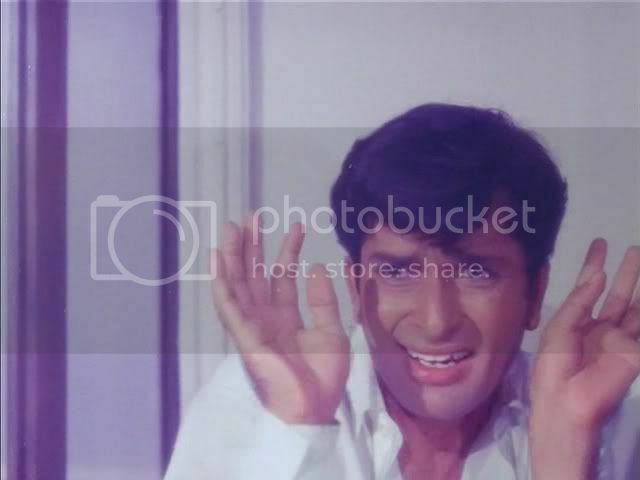 Now the fun is amplified - the audience doesn't know which Shashi has returned, and his behavior - highly traumatized after the fight; hell, who wouldn't be emotionally scarred after being strangled by their self?! - is a bit off. Who is this guy? It takes a kinda boring courtroom scene followed by an excellent expedition to Tibet (!) to solve everything. 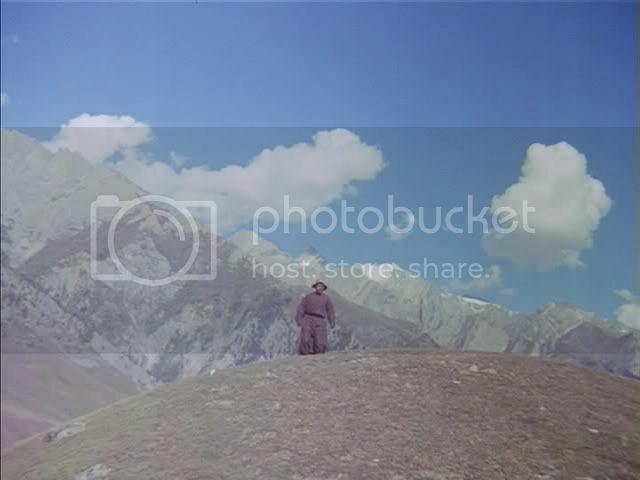 And any movie that features Tibet as a place of spiritual awakening gets major brownie points. There's also a pointless proletarian comedy subplot featuring Johnny Walker. We were annoyed by this, not because of the stupid jokes, but because it was all about Johnny trying to bed this mindless, personalityless woman, whose father kept declaring that he wouldn't let his honor be besmirched. The woman (played by Laali) was just a setpiece to be moved around by the two men, sometimes literally. It was misogynistic and dumb. OMG HER ANGST. MATCHING SPOUSAL ANGST. Beth thinks that this film starts strong and then goes off the rails at intermission. We at the PPCC instead loved every minute of it. We admit that this love depended critically on acceptance of the whole "Wait - did I marry Rakesh or Kamal?" dilemma. There are histrionic meltdowns galore in the second half, so if that's not your cake either, avoid. ...then there are ample rewards. "Nahiiiin!" There are also two very nice songs: first, the God of Transcendental Pine-Wooded Lovers' Duets - that is, Bekhudi mein sanam - and, second, the unexpectedly nice duet between Johnny Walker and Ameeta. Bekhudi mein sanam is one of those rare songs that the PPCC knew and loved before having seen a single Hindi movie. 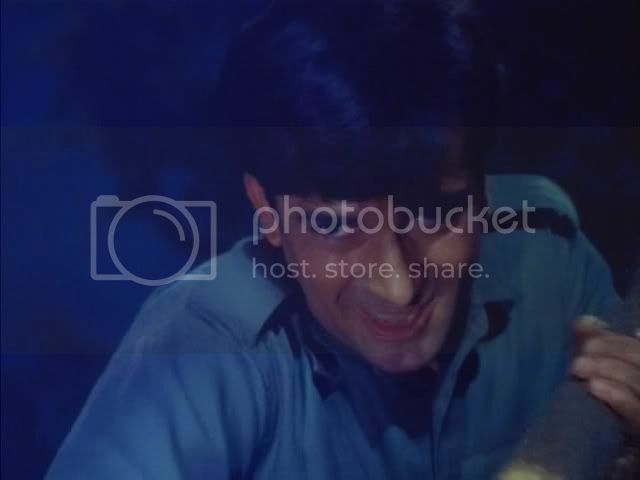 It was thus with great joy that we discovered, months ago, that it was picturized on our beloved Shashi. And today it is an even further joy to see that the filmi context surrounding it is as fun as ever. Our only disappointment is that the rest of the songs were sort of subpar for Kalyanji-Anandji. 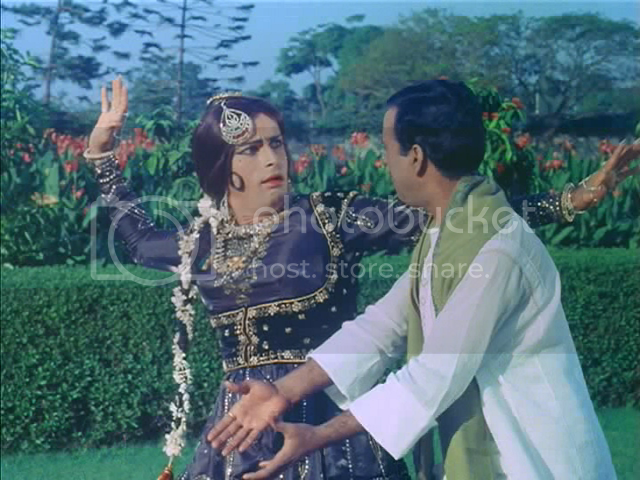 As we said, this film is really Shashi's show, and he demonstrates amazing energy and variety in his two performances. In fact, so good is he at demarcating Rakesh and Kamal with separate body language that we started to forget it was the same guy playing both characters. Talk about suspension of disbelief! 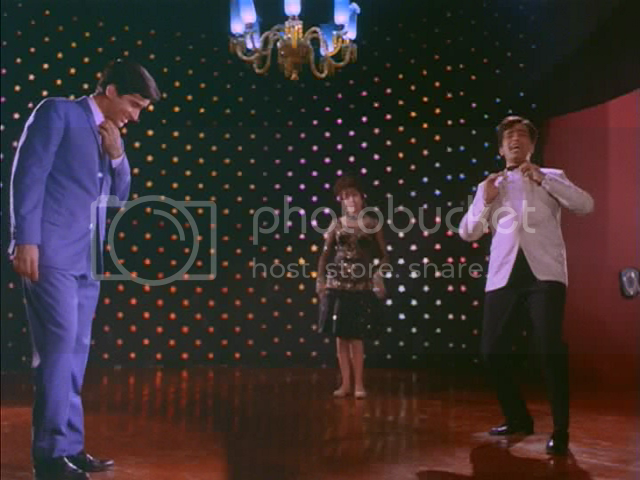 Shashi also threw himself head and foot into the dance numbers. We at the PPCC have seen so many Shashi movies that we've become very familiar with the stock expressions he used when phoning in a performance - in Haseena, it was all new! As is typical in Hindi movies of the era, the women's roles were either completely vacuous or just unlikable. Babita does as much as she can with Archana, which is to say she doesn't have much to work with. Her basic motivation is to get married and preserve her honor, and she doesn't have much of a personality beyond that. Meanwhile, Ameeta could have been replaced with a blow-up doll (in fact, that would have probably made the comedy subplot funnier). We were really impressed by the direction in this film, but that's no surprise - it was Prakash Mehra. Mehra directed the zany and ridiculous Namak Halaal, starring a by-then-much-older 80s Shashi paired with Amitabh, as well as the only tolerable Devdas adaptation, Muqaddar ka Sikandar. Haseena had some great shots, and overall it was a very skilfully told story. 1. Death of the self. OMG the movie starts off all Freudian, where Rakesh and Kamal could easily be symbolic of one man's dual natures (ego versus id? ), and then it turns Buddhist, where only by destroying his self + becoming one with himself can the man find peace! 2. Why are they identical? The film never resolves this seemingly incredibly important issue. They only tease us by alluding to it again and again. "Oh yeah, that's Kamal. No, I don't know why we're physically identical." Weird! Maybe the film's trying to say that, deep down, we're all the same - or, as the transcendentalist The Thin Red Line would have it, "Maybe all men got one big soul everybody's a part of, all faces are the same man." 3. The Tibetan bit. Gosh, we can't give too much away, but when ahem ahem cough cough happens and then ahem cough, we were so happy. Even a Tibetan hat! Be still, mera dil. We think this fully supports the Buddhist hypothesis. In fact, you know what, we've convinced ourselves. What's the point of making a chat off the record if you're going to publish it? Ts. Anyway. I am glad you loved this, and I think your love and my mixed feelings just underscore that our Shashi Venn Diagram circles do not entirely overlap, but that is totally cool, because with all those movies to choose from, there is no need to worry about perfect agreement. I too thought he was fantastic at making the two characters so distinctive. As for why this is the thing that impresses you...well, I don't know, actually. I'm just glad it does. Maybe the best Shashi for you is the one in multiple modes? So an all-anger/lust Shashi à la Junoon does not speak to your demanding brain/dil? You want it all! And thanks to masala, you can haz it! You didn't love the first three songs?!? OMG why not? I love your analysis, but my take on the lack of any explanation for identical Shashis is simpler: lazy script writing for an audience who doesn't really care. Oh my, this sounds good. Two Shashis for the price of one. Matching his and her angst; I am a sucker for suffering men, especially suffering handsome men. Right, this has to be part of my next Dvd-purchase (good thing I just got payed). Am with Beth on this - didnt you like the first three songs? And much though I rejoiced at the stalker not getting the girl in 60s Bollywood, I must say I liked bad Shashi so much better than the good one! Beth - At least I didn't mention that weird story you told me about the whipped cream and snakes. OOPS! I am demanding. I don't know. I was just dazzled by this movie, I can't explain why. All the emo, all the goofus dancing, all the glorious glorious madness. It was perfect! And no, maybe my ear is tin? The first three songs were... meh. I laughed and enjoyed, but they're not the musical velvet that is the Naina soundtrack. Memsaab - TUT! That is not the PPCC attitude! Our motto is, "Think harder about the movies than their creators did." And yes, Zanjeer was FAAAB (so much glorious Pran). Gebruss - Ah, we are sisters in the angst. This is a lovely movie if, like the PPCC, you are a sucker for masala and emo.